The Iiwi is the only remaining member of the genus Vestiaria. 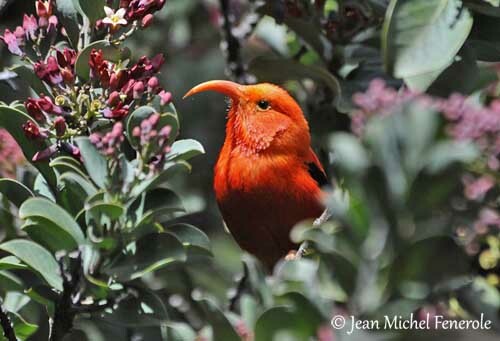 It has the heaviest bill of all the Hawaiian honeycreepers. 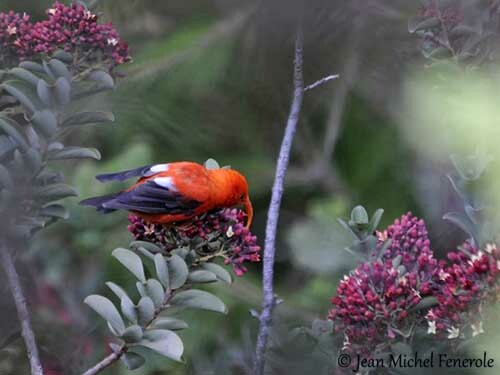 Its bright red plumage makes it very conspicuous when feeding on nectar, but it is often hidden among the foliage. It travels daily several kilometres to find its favourite flowering trees. Like the other Hawaiian species, the Iiwi is threatened by destruction of the habitat, disease and predation by introduced animals. 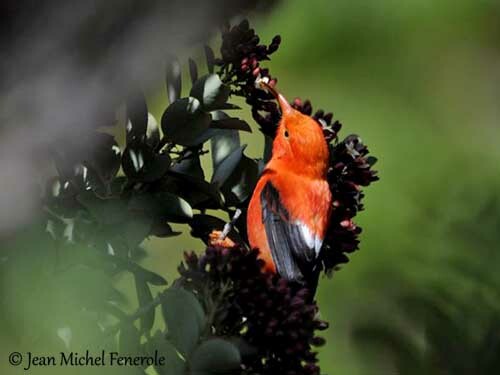 The adult male has brilliant scarlet-vermillion plumage on head and body, except the greyish undertail-coverts and the paler and more orange thighs. Wings and tail are glossy black, with a contrasting white patch on inner secondaries. Greater coverts are edged red. The head is bright red too. The heavy, sickle-shaped, down-curving bill is scarlet-orange but paler than plumage. The eyes are yellowish-brown to brown, surrounded by pale orange eyering. Legs and feet are like the bill. The juvenile has greenish-yellow body plumage with black-tipped feathers, giving scaled pattern. Cheeks, throat and scapulars are variably washed red. Wings and tail are dark grey with tawny to white feather edges. The patch on inner secondaries is pale grey instead white. Step by step, the colour fades to tawny-yellow. The moulting birds are blotchy, with irregular red patches. The bill is brown first, and changes gradually to the adult colour. The Iiwi is found on the main Hawaiian Islands, Kauai, Oahu, Molokai, Maui and Hawaii. The species is extinct on Lanai. The Iiwi is fairly common in wet forests at high elevation, with understorey of tree-ferns, koa and naio. 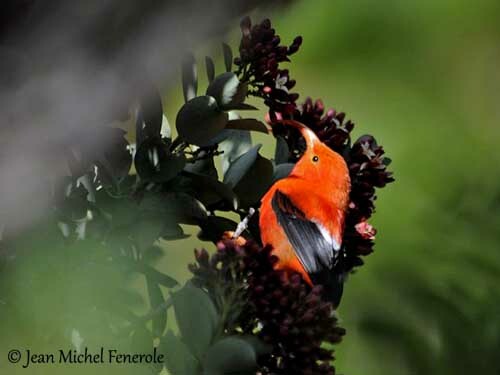 The species is seen mainly above 1250 metres, but also locally down to 300 metres and up to 2900 metres of elevation. The Iiwi utters “tui” calls and “ee-ee-ee-ee”, giving the bird its name, and human-like whistles, gurgling and a two-note “ker-weee” call. The song is a variety of whistles, and several unusual sounds such as the sound of balls dropping in water, or two balloons rubbing together, and a squeaky door hinge. The Iiwi is mainly nectarivorous, but it also takes invertebrates. Nectar and insects are taken from both native and non-native flowers. It takes the nectar from straight corollas such as Passiflora mollissima, but also from open-faced flowers such as Hibiscus arnottianus and Broussaisia arguta. However, recent observations report other behaviour, with the bird piercing corollas at base and stealing the nectar without pollinating. It moves slowly and often disappears into the foliage. The Iiwi usually defends its feeding areas during the peak of flowering, and the trees with abundant flowers. Insects such as moths and butterflies are taken while feeding on nectar. It may perform fairly long-distance flights, up to 15 km/day, searching for nectar resources. The flowering trees are scattered but locally abundant. It flies every day up Mauna Kea Volcano to the high-elevation mamane forests between September and November. 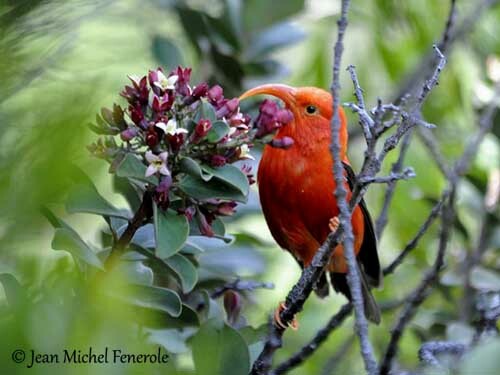 The breeding season is closely associated to the availability of ohia-lehua flowers. The male performs courtship displays such as song flight, and also wing-fluttering while singing. Courtship feeding occurs throughout the cycle. Both sexes sing during this period. Males are all year round in breeding conditions. They are monogamous but outside the breeding season, male and female separate. The pair defends the small nesting-site. 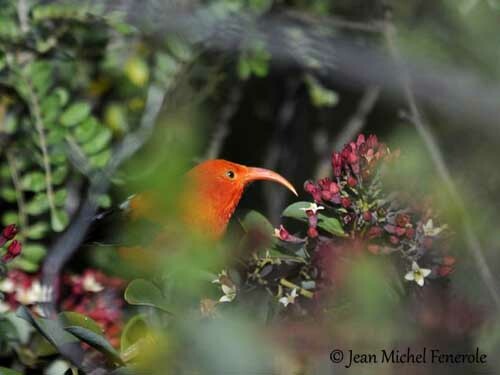 The territory (under 1000 m2) is larger than that of other Hawaiian honeycreepers. The Iiwi is resident in its range, but it flies between islands. Some dispersion is reported in search of flowering plants. The Iiwi is a strong flier and performs long, high flights when searching for food. Its flight is undulating, with rapid wingbeats interspersed with wings pulled to the body sides. A characteristic whirring noise is produced by the wings during the flight. The breeding season extends from December to July, with peak between February and June. It breeds in wet forests with ohia and koa as dominant tree species. Both adults build the nest, but mainly the female. The outer cup is made with ohia twigs and moss, whereas the inner cup is lined with bark strips and lichens. The nest is placed in terminal leaf cluster in ohia canopy, about 7 metres above the ground. The female lays 1-3 white eggs with dark markings. She incubates alone during two weeks, while the male feeds her off nest. She broods the chicks and feed them with the food brought by the male. The young birds fledge 21 days after hatching. They are able to fly from tree to tree and they follow their parent. They depend on adults for food for up to four months. This species can produce a second brood after nest failure. The Iiwi is relatively abundant, but it has restricted range and declines are reported, due to avian malaria and other factors such as degradation of the habitat, predation by introduced animals and invasive plant species. Management of native forests, fencing, removal of ungulates, control of invasive plant species and restoration of native forest, have contributed to an increase of some populations. But currently, the Iiwi is still listed as Vulnerable.